During its years in the Netherlands, the Isotype team developed strong links with the United States and carried out several major commissions for clients there. The director of the National Tuberculosis Association visited The Hague to seek Otto Neurath's advice. From this, there developed a close collaboration on visual material for health education. A similarly fruitful relationship developed with the Chicago publishers of Compton's Pictured Encyclopedia. In 1933, Neurath proposed a book about the 'pilgrimage of man' to New York publisher Alfred A. Knopf. This was agreed to during one of Neurath's visits to the US in the late 1930s. The result was Modern Man in the Making, a book in which Isotype charts are closely integrated with the text. Neurath considered it to be his masterpiece. Published on the eve of the Second World War, this book addresses many issues still of great relevance today: globalisation, war, the economy and emigration. 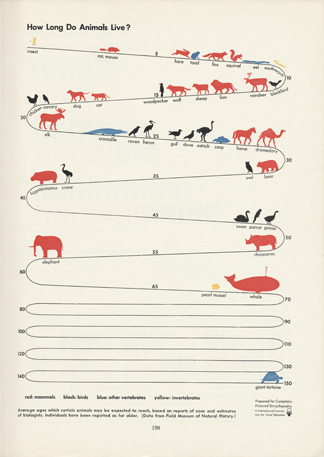 The book was created in what Marie Neurath called 'picture-text' style: a chart inserted into the text was not merely an illustration but constituted a 'paragraph' that had to be 'read' in order to follow the argument. The graphic matter was printed in seven colours. 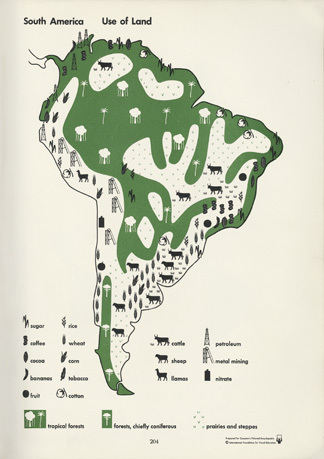 In 1936, Otto Neurath was in the United States to promote Isotype and seek out new work. While he was there, the National Tuberculosis Association commissioned a travelling exhibition of 17 charts to educate Americans about tuberculosis. Five thousand sets were produced for display in venues around the US, as well as a booklet version of the exhibition. 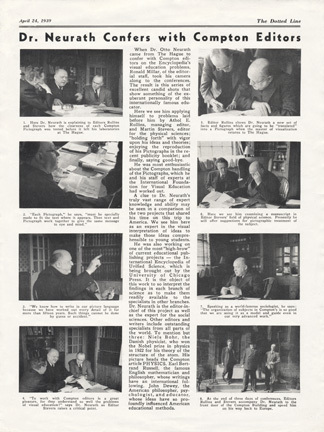 The publishers of Compton's Pictured Encyclopedia proved to be very sympathetic collaborators with Isotype, as suggested by photographs of Otto Neurath in animated discussion with them, shown in their house newsletter. 'Pictograph' was a term coined in the United States to refer to the pictorial charts (not the individual pictograms). Poster for F. E Compton & Co.
An extensive encyclopedia in a unified Isotype style remained an unfulfilled ambition for Otto Neurath. Instead, Compton's, an American children's encyclopedia, provided a brief opportunity for Isotype work in this context. These two charts are representative of the scientific and geographical subjects treated with Isotype. The zigzag lifeline in 'How long do animals live?' is an ingenious solution for fitting a lengthy, continuous procession onto a single page.